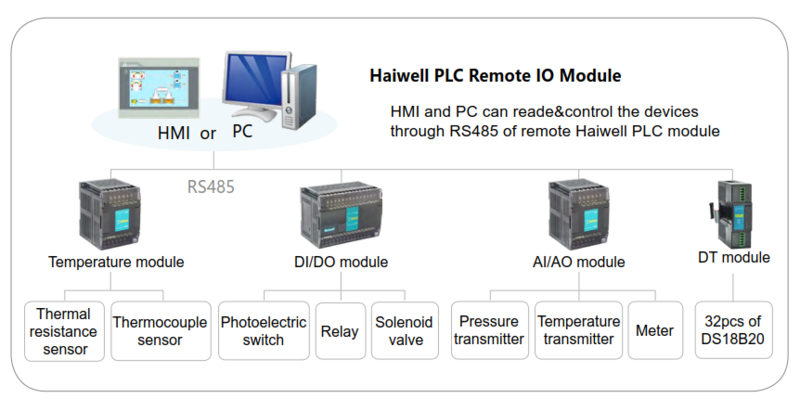 PLC Analog Modules-Xiamen Haiwell Technology Co., Ltd.
● Contain 20 types, can be classified by 4-point and 8-point. ● Signal types:current or voltage, a variety of optional signal range. ● Analog AI/AO support 6 types of signals: [4,20]mA, [0,20]mA, [1,5]V, [0,5]V, [0,10]V, [-10,10]V.
● Hardware conversion accuracy:12 A/D conversion hardware, range:0~32000. ● Comes with a RS485 communication port, which can be use for remote I/O. ● It can be used as expansion module for any host.